Poland had a chance to bring together the leaders of Russia and Ukraine at the commemoration of Auschwitz’ death liberation, but instead some Polish politicians cherish “anti-Russian phobias,” says former Polish PM. With the 70th anniversary of the infamous Nazi death camp’s liberation in Poland commemorated next Tuesday, Warsaw could have organized a meeting between President Vladimir Putin of Russia and his Ukrainian counterpart Petro Poroshenko, said Leszek Miller, the leader of the Democratic Left Alliance, Poland’s third-largest opposition party. Miller headed the Polish government from 2001 to 2004. “Poland should have done this. This even could help us reemerge as a nation contributing to a peaceful resolution to this bloody conflict,” he said at a media conference, referring to renewed hostilities in eastern Ukraine. He said Poland had been sidelined in the mediation process regarding the Ukrainian conflict, but the Auschwitz gathering was a rare opportunity, considering that lately international negotiations on the situation have stalled. But Polish officials chose to make it clear Putin would not be welcome at the event, with Moscow sending a lower ranking official to represent the country at the commemoration, while Poroshenko would be a guest of honor. The Polish foreign minister further sparked controversy this week by claiming that Ukrainians should have credit for liberating Auchswitz. “The 1st Ukrainian front and Ukrainians liberated [the concentration camp], as on that January day there were Ukrainian soldiers, so they opened the gates of the camp,” Grzegorz Schetyna told Polish radio on Wednesday. The claim is historically inaccurate. While there were Ukrainians among the soldiers of the Soviet 1st Ukrainian front, the force was multiethnic and included Russians, Belarusians, Armenians, Georgians, Tatars, Chechens, and a plethora of other ethnic groups. Not all of the fighters were even Soviet citizens, because it included Polish Army’s 2nd army. The front was called Ukrainian because its operations were mostly focused on Ukraine. German Foreign Minister Frank-Walter Steinmeier refuted his Polish counterpart’s claim on Sunday by giving the credit of freeing the Auschwitz concentration camp to the Red Army. “Auschwitz was liberated by the Red Army. I am sure that this day is of great importance for Russia,” Steinmeier told Bild in an interview. 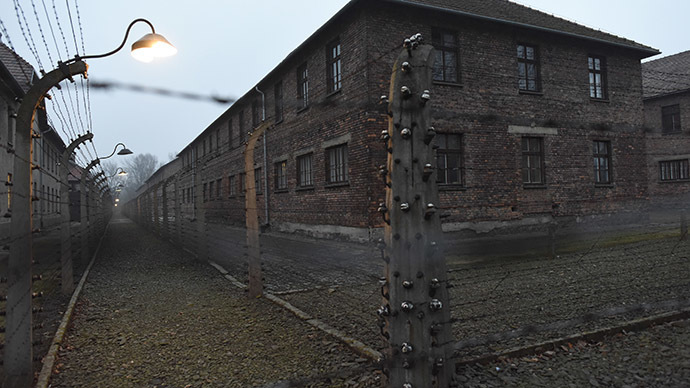 The Auschwitz museum distanced itself from the scandal, saying it doesn’t comment on political issues. The minister himself tried to contain the publicity damage on Friday by explaining his statements. In an interview with radio ZET, he said he had meant to say the driver of the tank, which actually tore down the gates of the death camp, was Ukrainian. He promised to speak more clearly in the future. “This is dangerous for our country, hurting our trade relations,” he explained. Amid the ongoing crisis in Ukraine and the confrontation between Western nations and Russia, it appears history is increasingly being misinterpreted by some people for the sake of making a bold statement. Ukraine’s Prime Minister Arseniy Yatsenyuk sparked controversy, not unlike the Polish FM, by claiming that during World War II Russia “invaded” Ukraine and Germany. He later explained he didn’t mean Russia attacked Nazi Germany (in fact, it was the other way round). He had been referring to the post-war partitioning of Germany by the Allies.